Preschool pet crafts coordinate well with a variety of preschool pet lessons and activities. Children love animals and enjoy making crafts. This project combines the two to help kids make their own 3-D pets. Preschoolers will use coloring, cutting and gluing skills for this craft. The project may also be used to help practice color and shape recognition. This article explains how to create the 3-D dog shown in the above photo. With only a few slight alterations to the body parts, the template may be used to create other preschool pet crafts, as well. 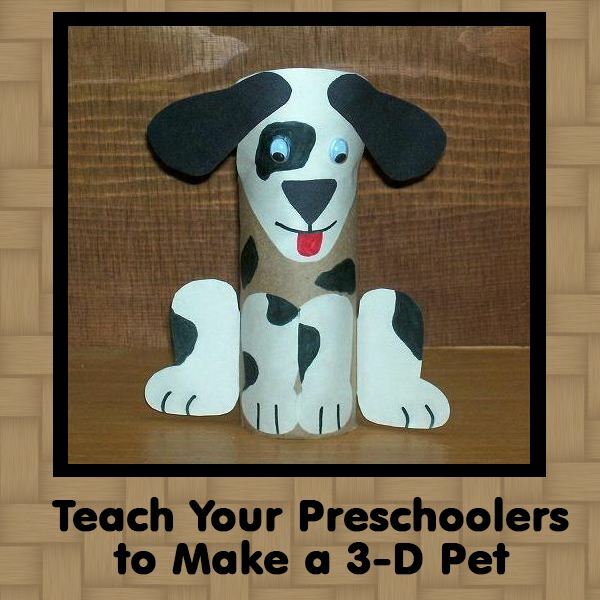 To prepare for this pet craft, the teacher must print out the Preschool 3-D Pet Craft Template located in the Early Childhood Education Media Gallery. Print a copy for each child. The template has all of the pet body parts drawn to the correct scale for the project. 1. Give the children their own copy of the printed template and crayons or markers. Ask them to color and decorate the body parts anyway they desire. To help the kids practice colors and shapes, you may also choose to give specific directions. For example: Color the dog's head yellow. Use the brown to draw spots (or circles) on his legs. 2. Once the body parts are colored, have the children practice cutting out the shapes. 3. Provide each child with a toilet paper roll. Stand it on end to serve as the base of the 3-D pet. 4. Help preschoolers glue each of the main body parts in the correct locations to create a dog. Note: To make the back legs protrude from the sides, a fold must be made for each of them. Fold the legs along the dotted lines to make a tab and then glue only the tabs onto the toilet paper roll. 5. Give the kids googly eyes, scraps of material, paper or crayons to add eyes, nose, mouth and other details to the 3-D pet. Prepare the board ahead of time by covering with a light color (light blue, white or beige will work well). Then arrange long, thin strips of brown paper to create a window frame effect across the entire bulletin board. Add other details such as precut animal shapes, bird cages, shelves, and other items seen through a pet shop window. Add a short phrase which coincides with the pet lessons the children have been learning. After the 3-D pets are complete and the glue is dry, show them off on the class bulletin board. Attaching them to the board will not damage them if done properly. Place a small tack in your hand and then reach your hand inside (from the bottom) of the toilet paper roll. Push it gently into the back of the cardboard roll and tack it into place on the bulletin board. When it's time for the children to take the 3-D pets home, simply remove the tack and the pinhole will be barely visible on the backside of the project. This preschool pet crafts project for making a 3-D pet is sure to be a huge hit with kids and will add a fun touch to any class bulletin board.